This volcano sits on the top of an uplifted portion of the martian crust, similar to but not much smaller than the uplift associated with the Tharsis volcanoes (slides #2 through #13). The flanks of Elysium Mons are steeper (about 10º) than the flanks of the shield volcanoes so that Elysium Mons may consist of volcanic materials more chemically evolved than the fluid lavas associated with the Tharsis Montes. A single, very circular caldera is present at the summit of the volcano. 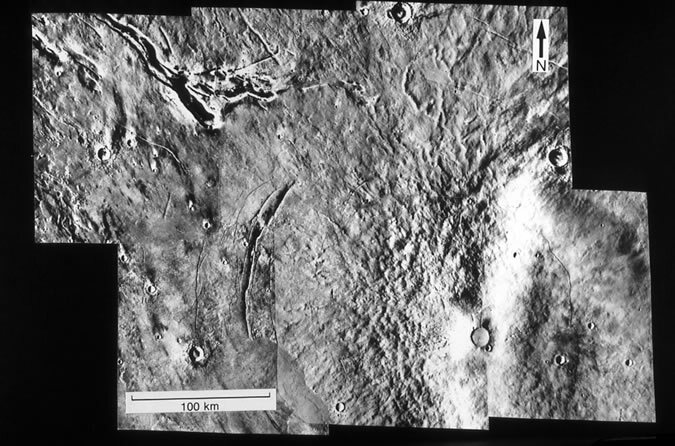 Several large channels have their origin northwest of the volcano, perhaps carved by flowing mud and water released by the heat associated with the Elysium volcanism. 15 N, 213 W; Viking Orbiter frames 541A41 to 46, high-pass spatially filtered orthographic version.